Russia has accused the UK of inventing a "fake story" and "playing with fire" over the Salisbury spy poisoning. 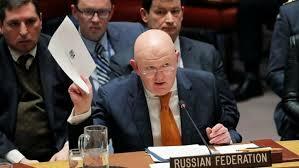 At a UN Security Council meeting, Moscow's UN ambassador Vasily Nebenzia said Britain's main goal had been "to discredit and even delegitimise" Russia with "unsubstantiated accusations". The UK says Russia is behind the attack but Moscow denies responsibility. Britain's UN representative Karen Pierce said the UK's actions "stand up to any scrutiny". She likened Moscow's requests to take part in the investigation to an arsonist investigating his own fire. Russian former spy Sergei Skripal and his daughter Yulia were found unconscious in Salisbury on 4 March. Ms Skripal, 33, is recovering in hospital and has released a statement saying her "strength is growing daily".